(September 2000) Benton Harbor, MI. 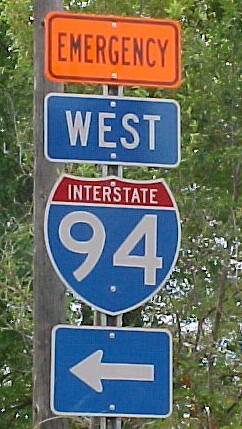 Standard Michigan interstate signs no longer carry the state name. Michigan marks alternate EMERGENCY interstate routes for ambulances and fire trucks in case the main route is blocked for some reason. 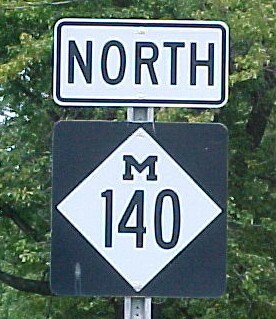 Older Michigan interstate sign with the state name. Michigan began phasing these out during the 1980's (Photo by Joe Koehler). (September 2000) Watervliet, MI. Three-digit signs simply use a condensed font. (September 2000) Around 1970, MDOT marked more important county highways throughout the state with these pentagonal markers. These county roads can cross county lines and retain the same number. The letter signifies the geographic region. A-C routes are along the west side of the lower peninsula from south to north. D-F routes are along the east side of the lower peninsula from south to north. G and H are used in the upper peninsula. 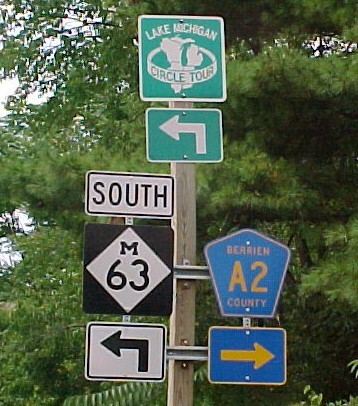 Also included on this assembly is the Lake Michigan Circle Tour sign. (September 2000) Benton Harbor, MI. The Red Arrow Highway follows along the old routing of US-12. What is currently US-12 used to be US-112 which was decommissioned after I-94 was completed. The highway commemorates the Red Arrow 32nd Brigade during World War II. 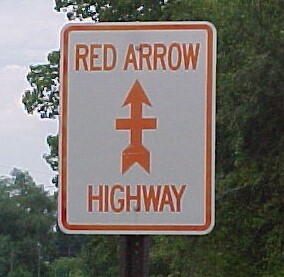 This Red Arrow Highway marker has faded a little - now it's the "Orange Arrow Highway"?